Bangalore/Mumbai/New Delhi, India (19 July 2018) : After nearly thirty years of success in the midsize sedan category, the seventh-generation Lexus ES is set to redefine its status among executive sedans. 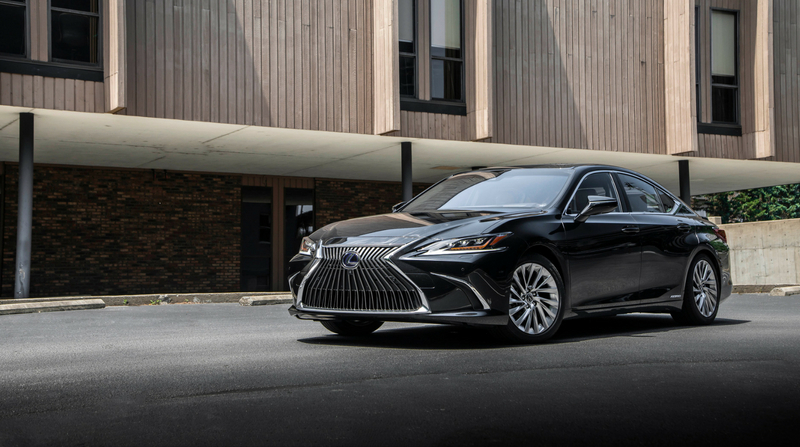 Long known for its unparalleled comfort, refinement and luxury appointments, the new Lexus ES builds on its strengths with an all-new chassis that delivers a more emotional exterior design along with a superior driving experience. Powered by a 2.5-liter, four-cylinder petrol engine combined with the new, fourth-generation Lexus Hybrid Drive System, the hybrid electric ES 300h, features a level of craftsmanship rarely found in this segment, and will appeal to guests who appreciate comfort, refinement and luxury. A key element of the new ES 300h is the all-new Global Architecture – K (GA-K) platform. More than just an engineering achievement, the GA-K platform gave the designers the flexibility to create a vehicle that’s as visibly striking as it is enjoyable to drive. Its lower stance and proportions reflect its performance capabilities, and the slim LED headlamps with distinctive L shaped marker lights give the ES 300h a stunning new appearance that guarantees a second look. In keeping with the Lexus spirit of hospitality or omotenashi, passenger comfort, a hallmark of the classic ES range remains the highlight in the seventh-generation as well. Designed for those who like to travel with their friends and family, the driver’s control panel and display have been moved closer to the driver, to provide extra space for the front passenger, guaranteeing a relaxed journey. Rear passengers are assured of an equally comfortable ride with an extended legroom of 998.6 mm, made possible by the longer wheelbase. Guided by human-centered design principles, console mounted climate and audio controls along with adjustable and heated semi-aniline seats, and the 17 speaker Mark Levinson Pure Play system, create the perfect ambiance for those accustomed to immersive sophistication wherever they go. “The Lexus ES has undoubtedly been one of our most well-loved vehicles, and this new generation model builds on its strengths to offer a driving experience that is as powerful and exciting, as it is elegant and sophisticated. The launch of the all-new Lexus ES 300h is a reiteration of our commitment to crafting vehicles with enhanced excitement, passion and innovation; and this car will continue to offer our guests a wide range of options, each crafted consciously, and designed exquisitely to meet their exacting standards of excellence,” said N Raja, Chairman, Lexus India. Setting new benchmarks in its class, the ES 300h features a new fourth generation Hybrid Drive system that shatters all preconceived notions of hybrid electrics. The Euro 6 compliant, new hybrid electric system coupled with the four-cylinder petrol engine, delivers improved linear acceleration, a combined 160 kW of total power, and a mileage of 22.37 km/l. Crafted for those who value not just a high-performance drive but a safe and secure one as well, the ES 300h includes a class leading 10 airbags, Hill Start Assist, Vehicle Stability Control, and Anti-theft system, with break-in and tilt sensors. Driver comfort and ease of drive is as important in the new ES 300h as passenger comfort, and the cockpit features a 7-inch LCD instrument panel with a large analog tachometer, digital speedometer and an easy-to-read multi-information display, in addition to a fully adjustable color heads-up display that projects relevant vehicle information onto the windshield. The navigation system on the 12.3-inch Electro Multi Vision (EMV) full-size display, and the wireless charger built into the new ES, further aid in reducing distractions while on the road. Precise steering inputs are delivered by a new rack-assist type Electric Power Steering (EPS) system, and the ES offers a Drive Mode Select system that allows the driver to tailor the car’s settings to varying road conditions with Eco, Normal and Sport modes. MacPherson struts in front, a trailing arm and a multilink setup in the back with stabilizer bars at each end, coupled with 18-inch, multi-spoke alloy wheels, ensure accurate handling, and make the ES an extremely comfortable and quiet car to drive. Due to the reconfigured rear suspension, cargo room has been increased, and the new ES 300h features 454 L of cargo space with an auto-open trunk, that also fits in a full sized spare wheel. For the perfectionist who demands a range of options, the interiors feature four color schemes, and three types of trim, in addition to the array of nine eye-catching paint colors available on the exterior. Along with Black, Chateau and Topaz Brown, the ES also introduces a light new Rich Cream interior that offers a striking contrast to the deep brown dash and roof trim. The ES offers two shades of Shimamoku wood trim (black, brown), as well as light-colored Bamboo. The mark of Takumi craftsmanship is evident in the new ES, in the soft padding of the instrument panel, where each stitch is embedded into materials for a 3-D effect. “The new Lexus ES 300h takes comfortable elegance to the next level and presents a vehicle that sets new benchmarks in its class. Every element in the ES 300h is a reminder that nothing is crafted like a Lexus. From the sleek new look to the impeccably finished interiors, the ES 300h is the perfect choice for guests who redefine the parameters of success and achievement, through their work,” said P B Venugopal, President, Lexus India. The Lexus ES 300h will be available for booking from 19th July 2018 at INR 59, 13, 000 (Pan- India) (ex-showroom). Lexus began its journey in 1989 and has, since then, expanded its line-up to meet the needs of luxury consumers around the world. It is now going beyond its reputation for high-quality vehicles with the integration of innovative technology, emotional exterior and interior designs, and engaging driving dynamics and performance. Lexus is the luxury hybrid leader, having sold over a million hybrid vehicles globally. Lexus vehicles are sold through a network of dealers who are committed to delivering exemplary guest experiences.